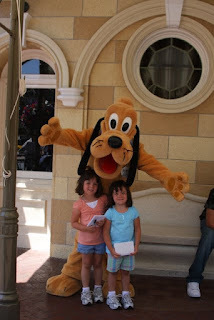 Day 1 at Disney just about wore all of us out, but the girls are ready to go back. We left later in the day so that Dianna could do laundry. On her way out, I told her to put it all in one load. She came back and said that the washer was too small to handle our giant wash load, so she had to split it up, which delayed our visit to Disney to even later. We ended up eating at Panda Express along the way to save on expenses. Last night's meal at Taste Pilot's Grill was $36 for burgers and fries for everyone! We are now one for two on our parking garage battle. We got to park on the Disney side of the parking structure which saved us about 1/3 of a mile walk. We finally got into the park around 1:00. 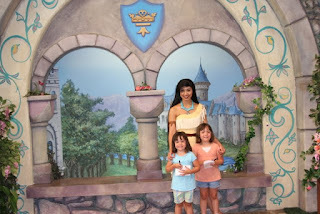 First, we hit up the Princess Faire again to see if the girls could meet with different princesses that weren't there the previous day. 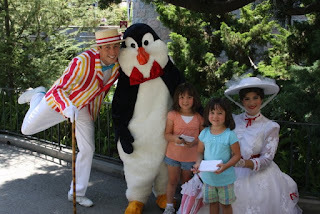 On the way there we ran into Mary Poppins and some peppermint dude and his penguin friend. After this encounter M. keep stating, "I didn't know Mary Poppins was Disney." 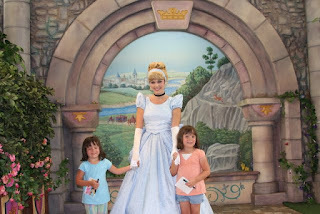 At the Princess Faire, the girls meet two new ones, but again, Belle left before they could meet her. We then rode Snow White's Scary Adventure. Even though it's just a small ride, some of the dioramas were a little too intense for the girls. 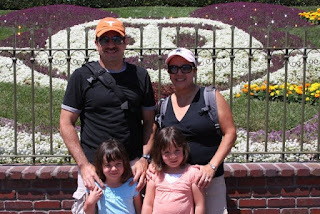 Next, we saw the Magical Parade, the Playhouse Disney show at CA Adventure Park, some little rides in the Bug's Life area, some rides in the Paradise Pier area, then it was off to see the "Sky Movie", aka Soarin' Over California (click the link for a low-res youtube someone posted). I rode the California Screamin' coaster by myself since Dianna hates big roller coasters. It was great - one of the good things about this coaster is that it doesn't have a slow take-off going up a big momentum hill in the beginning. It just fires you off. Something else cool about this ride is that you are listening to music specifically made for this ride coming from speakers behind your head, which greatly adds to the ride experience. After that, we headed over to the Corn Dog Castle to try one of the infamous corn dogs. It was good until I finished it...then I felt bad, really bad. This corn dog was so big it took about 20 mustard packets. I have not eaten this bad in years! It's tearing my stomach up. The fatty, fried food, not to mention not working out, has made feel very guilty. My first workout at LA Fitness is going to be painful, especially my rowing. 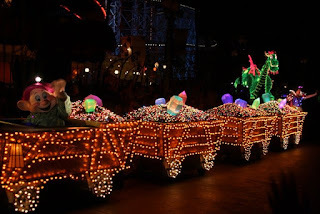 Next, we watched the Electric Parade in CA Adventure Park, which is pretty cool. After dark, all the floats are lit up, as well as costumes on the characters. 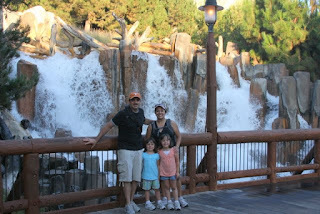 We then headed back to Disneyland to try to catch the fireworks show. Dianna had read about a specific location to watch, but after fighting our way through a massive crowd, I wondered what was so special about this particular spot. Dianna said that we would be able to see Tinkerbell fly over Sleeping Beauty's Castle. I asked how we were able to see Tinkerbell, and she didn't know. So we decided to leave. Just as we were starting to walk out, they decided to cancel the fireworks due to high wind. So then, everyone got up and left. You have to understand, we are shoulder to shoulder in a massive crowd and we are pushing two strollers. The tram to the parking lot had huge lines, too. Now the drive back to our hotel - a little about our hotel in Anaheim - although it was clean and functional, it didn't have a good feel - it had a French Victorian decor. I think we are all just used to staying in Hilton branded hotels (this was not). It was located between the Honda Center and Angel Stadium. The NY Yankees were in town playing the Angels, and, as we were driving back to the hotel, the sold out game let out. This added about 10 minutes to our trip back. Ten minutes doesn't seem long, but after a day 2 at Disney, it seemed like it took forever.